I spent two years in Huntington, West Virginia from 2008 to 2010 attending graduate school at Marshall University and working as a graduate assistant basketball coach. Upon visiting for the first time for my interview with the coaching staff I was second guessing my move from Michigan down to the unknown of West Virginia. Thankfully, my desire to receive a free education and the pursuit of coaching experience was far greater than my desire to avoid something uncomfortable. My two years there were filled with a ton of memories and experiences, and an appreciation for a city that had received its share of blows, but was still striving to live up to its Jewel City name. After graduating I made it back a few times, but since moving to Texas I've not been back to Huntington. So, this is some perspective from afar, but from one who knew the city well and hopes for its continued renewal and revitalization. 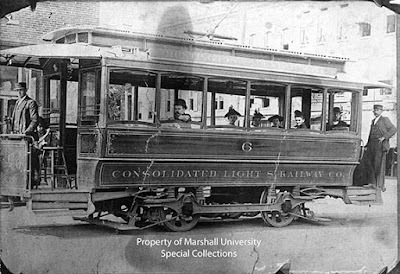 Due to its location at the confluence of a number of rivers, Huntington boomed in the late 1800s and early 1900s, and continued to grow as a result of the coal and railroad industries. Huntington has the distinction of actually being the second city behind Richmond, Virginia (others have claimed San Francisco as well) to have had an electric street car system. However, as oil began to become less expensive in the later part of the 1900s, coal mining decreased, leaving Huntington with a declining population, followed by compounding factory closures. Those closed factories hope to play into redevelopment plans in Huntington. Fortunately, there have been a number of projects aimed at revitalizing the city. The Pullman Square redevelopment helped revitalize Downtown Huntington, adding a movie theater, parking garages, and blocks of restaurants and retail. As Huntington's Superblock, Pullman Square was the result of planning that started in the 1960s as urban renewal, and included a number of failed proposals and a few court cases. Eventually, in 2004 the development opened, and continues to be a success today. Unfortunately, Huntington has had decades of suburban-style development that detracted from supporting its downtown. This is reflected in the attitudes of former leaders of Huntington, highlighted in this Strong Towns article and video, Huntington Calling. The attitude toward traditional, and now wildly successful development, is astounding. When Jean Dean, former mayor of Huntington, asked Chuck Marohn "Why on earth would we go back in time 70 years to model our current cities on? Times have changed", all he could do is respond with: "because it worked." 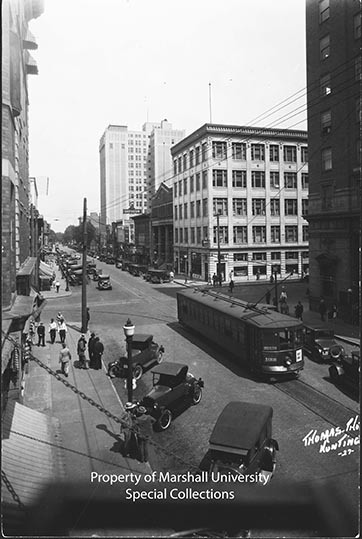 Huntington once created value in its downtown. It's time to do that again in the city. "new recreational and riverfront facilities; retail and hotel development; research and development facilities; green infrastructure for storm water management; and the advanced polymer center." The City of Huntington, Marshall University and a list of other public and private entities hope to partner in developing four areas: University Park, the Sport Complex Expansion, the Foundry Center and the Polymer Tech Center. The Herald-Dispatch gave a detailed recap of the proposal, which was presented by Sean Garrigan of Stromberg/Garrigan and Associates, a firm with great experience in brownfield redevelopment, especially in the Appalachia and Rust Belt regions. (Full presentation here). The expansion and support of existing industrial and technological industries in Huntington is important, especially with the decrease of coal and heavy industrial jobs in the past. Providing more opportunities for vocational training and partnership with Marshall University's College of Information Technology and Engineering would be a great benefit. Creating a new market for entrepreneurs, especially those that do not need large amounts of space, or that can utilize co-working spaces, opens Huntington to new industries. There's also something about rust-belt cities that is attracting more young, creative professionals who feel a bit more freedom in their pursuits. Rust belt cities also tend to have a base of professionals that have practical manufacturing knowledge: meaning, in Huntington, it might not be flashy, but there are likely people there that can get things manufactured. Added hotel rooms near sporting facilities would allow Marshall University to compete with other cities for Conference USA championships, as well as regional and national youth tournaments that might regularly utilize recreational and lodging facilities in other municipalities. The planning and building of, especially publicly funded facilities for athletic competition, is an increasingly sore subject for cities, but this seems like a different circumstance given the involvement of a university. Providing access to the Ohio River riverfront is an area that Huntington has greatly missed. It's understandable though, as Huntington's flood wall is a monstrous physical barrier. The 11.5-mile wall was built starting in 1937 as a way to protect Huntington from devastating floods, and reaches as tall as 20 feet high in some places. City officials once talked about the possibility of an "invisible" flood wall, but this approach is likely too costly, in terms of infrastructure and labor costs, as well as insurance costs for property owners, to ever come to fruition. The wall, at its northeast terminus, ends between 24th and 25th Streets, between the Foundry Center and Polymer Tech Center development zones. With a trail head at the extension of 25th Street, a connection to the Harris Riverfront Park could one day be made. At some point, the effort should be made to connect these trails, joining other trails in the Paul Ambrose Trail for Health. It would be a legacy fit for Huntington. The existence of the flood wall and railroads creates fragmentation when considering circulation between Highlawn and the proposed development zones. Further connection for the Highlawn neighborhood can allow for better pedestrian facilities and streets. Highlawn, with its proximity to Downtown Huntington and Marshall University, combined with possible connectivity through trails and streets, would be able to boast in its unique setting. Investment on the periphery of the neighborhood can spur revitalization of homes and continued building of characteristics, like street trees, landscaping and wayfinding that would set the neighborhood apart from others. 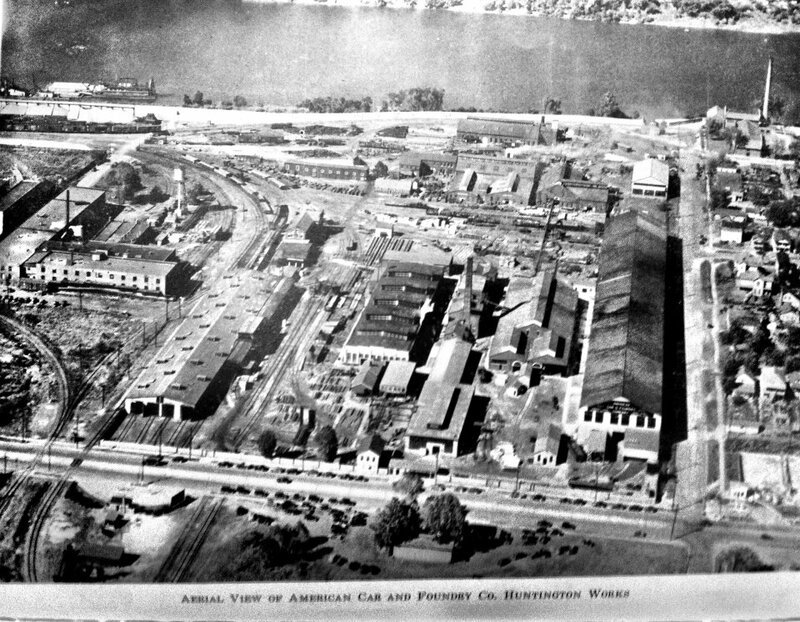 At this point, it might also be beneficial to mention the ability to preserve some of the heritage of the American Car and Foundry (ACF) sites. Huntington greatly benefited from the fact that ACF was located in the city, so preserving the buildings when feasible is a great start. It is impressive that these buildings have been on the ACF site for nearly as long as Huntington has been a city. The plants built railway freight cars, mine cars and other equipment. ACF was responsible for introducing the center-flow covered hopper, which became an industry standard, building over 100,000 of the cars in Huntington. You'd recognize them if you've paid attention when you're stopped at a railroad crossing. Work has now ceased in Huntington, with ACF's headquarters now located in Missouri, and manufacturing in Pennsylvania. It may also be possible to incorporate some railroad and industrial themes into any public or private infrastructure improvements. The Hardy Yards development in Houston is one example, and the Pearl Brewery development in San Antonio. Streets in the Highlawn neighborhood also appear to have been brick a one time, consistent with many of the other streets in Huntington. The inclusion of brick into the streetscape design would help tie the areas together. To this point, the proposal wouldn't be simply improving or enhancing amenities, it would be creating them. There are no parks in the interior of Highlawn. Riverside Park, which is at the extreme northern boundary of the neighborhood, is the area's closest park. A lively public realm with parks and tree lined streets can certainly enhance physical activity within the neighborhood, and increase economic development. Parks are an important component of cities and provide an opportunity to improve public health, especially in a city that has been recognized as the unhealthiest city in the country. It doesn't take monument parks like Ritter Park to spur this activity. Parks can be small, or linear. Either way, you want to have more of them. More and more, cities are finding that rigid Euclidian zoning does not work to promote the mix of uses that so many of them want, especially in downtowns and other districts. So, cities amend their zoning codes to allow a greater variety of uses, or rezone land for planned unit developments, which often times gives cities a bit more bargaining power with respect to form, and characteristics like building setbacks. Most of the area within the four development zones is currently zoned as I-1, General Industrial, and with a Special Use Permit, would allow for Planned Unit Developments. This would give some flexibility to the mix of uses, as well as their orientation with respect to the street and other buildings. Huntington's zoning map is integrated with Google Earth, which makes exploring the city and current land use rules, quite easy. As part of my graduate studies, I partnered with current Huntington Planning Commissioner Will Holland, examining what Huntington could do to enhance its streetscape, design and connectivity. While our proposals did not include site specific redevelopment, we did recognize the importance of corridors and gateways in Huntington. This sixth theme does the same. Huntington includes some great destinations, including the Marshall campus, Central City, Downtown Huntington, and the future University Park and Foundry Center areas. Connecting those places will be crucial. As Marshall University continues to grow and expand its educational opportunities and host athletic, educational and performance events, it is important that Huntington is able to better capture the attention and economic impact of students and visitors. By providing continued connectivity to campus and the city, especially Downtown Huntington (a recent Herald-Dispatch article summarizes the continued growth of Downtown), the city can better capture spending that might otherwise be taken to areas outside the city limits. Marshall has a baseball team, but is without a baseball stadium. It is remarkable that their teams have been as competitive as they are, given the team has no on-campus field facilities, and plays their home games at a YMCA field about 5 miles outside of town, or in Charleston, WV. It wasn't until a few years ago that the Track and Field teams, remarkably, had a track on which to practice and compete. (Now they have an indoor track as well.) But, the opportunity is there to create a space adjacent to campus, adjacent to Dot Hicks Field, that can hold baseball games, as well as other civic or university events. 3rd Avenue has relatively high speeds for a road adjacent to a university campus. The posted speed limit is only 35 MPH, but the design, and one way direction of the road, likely induces much quicker travel. With one way streets, it may be hard to replicate the success of Downtown Huntington. Normally, one way streets are not too good for small cities and retail. While this is a long shot, extending the development pattern of Downtown Huntington, and creating more walkable places, might be supported through the change of one way streets to two way streets. In looking at Huntington's zoning code, most of the commercial land along 3rd Avenue is zoned as C-2, Highway Commercial District. This zone has a 15-foot setback, which is not ideal along walkable thoroughfares. This space usually ends up being parking, or some sort of landscaping that is not maintained well. A few blocks of 3rd Avenue already have commercial properties, which are zoned C-2, adjacent to the right of way, so the hope would be that this continues through the University Park and Foundry Center development zones. One proposal would be in building apartment or student housing within the University Park development zone. It's been a while since a new apartment complex was built near campus, with The Village on Sixth being the largest single apartment complex near campus. Honestly, it's surprising to me that there hasn't been a greater attempt at more apartment complexes near campus, especially within walking distance of campus. To promote walkability, there need to be people. It can start with apartments. This is especially true for a number of blocks near the Foundry Center. There are three blocks that are currently zoned R-5, the highest intensity residential zone, which seem underutilized. As connections with the Marshall campus and other districts occur, this portion of R-5 zoned land would be well suited for multifamily redevelopment, or development of single family homes on smaller lots. What would help this area be an even more representative extension of more dense parts of Huntington, is a relaxation of the building line setbacks, especially if future development in the Foundry Center zone is built to more urban standards, and the setback lines of the ACF buildings are preserved through redevelopment of the existing structures. These efforts are plans, and nothing more at this point. But, it's important that Huntington see what can be done with so much of the land that is currently unproductive, especially parcels that are in prime locations, and have the ability to greatly contribute to the city's tax base. Sean Garrigan, of SGA, noted that "What will happen will not look like this plan, which seems contrary to this effort, but without going through this effort you won't know what the opportunities or priorities are." Yes, these are plans, but this exercise of visually seeing what is possible is important. These plans could act as a catalyst for investment for areas on north side of 3rd Avenue. Huntington can now use this in attracting developers that want to play a role in the city's continued redevelopment. Bonus: During some research I came across this flag proposal for Huntington from the 1970s, "Huntington, geared for progress." A very informative article. I felt like I got to explore the whole city in just 10 minutes. The pictures are really nice too. Thank you for sharing your experience.